"DMSO" redirects here. For other uses, see DMSO (disambiguation). Dimethyl sulfoxide (DMSO) is an organosulfur compound with the formula (CH3)2SO. This colorless liquid is an important polar aprotic solvent that dissolves both polar and nonpolar compounds and is miscible in a wide range of organic solvents as well as water. It has a relatively high melting point. DMSO has the unusual property that many individuals perceive a garlic-like taste in the mouth after contact with the skin. In terms of chemical structure, the molecule has idealized Cs symmetry. It has a trigonal pyramidal molecular geometry consistent with other three-coordinate S(IV) compounds, with a nonbonded electron pair on the approximately tetrahedral sulfur atom. It was first synthesized in 1866 by the Russian scientist Alexander Zaytsev, who reported his findings in 1867. Dimethyl sulfoxide is produced industrially from dimethyl sulfide, a by-product of the Kraft process, by oxidation with oxygen or nitrogen dioxide. The methyl groups of DMSO are only weakly acidic, with a pKa = 35. For this reason, the basicities of many weakly basic organic compounds have been examined in this solvent. Deprotonation of DMSO requires strong bases like lithium diisopropylamide and sodium hydride. Stabilization of the resultant carbanion is provided by the S(O)R group. The sodium derivative of DMSO formed in this way is referred to as dimsyl sodium. It is a base, e.g., for the deprotonation of ketones to form sodium enolates, phosphonium salts to form Wittig reagents, and formamidinium salts to form diaminocarbenes. It is also a potent nucleophile. In organic synthesis, DMSO is used as a mild oxidant, as illustrated by the Pfitzner–Moffatt oxidation and the Swern oxidation. Related to its ability to dissolve many salts, DMSO is a common ligand in coordination chemistry. Illustrative is the complex dichlorotetrakis(dimethyl sulfoxide)ruthenium(II) (RuCl2(dmso)4). In this complex, three DMSO ligands are bonded to ruthenium through sulfur. The fourth DMSO is bonded through oxygen. In general, the oxygen-bonded mode is more common. 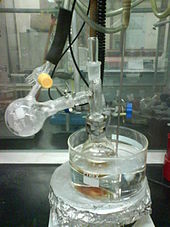 Distillation of DMSO requires a partial vacuum to achieve a lower boiling point. DMSO is a polar aprotic solvent and is less toxic than other members of this class, such as dimethylformamide, dimethylacetamide, N-methyl-2-pyrrolidone, and HMPA. DMSO is frequently used as a solvent for chemical reactions involving salts, most notably Finkelstein reactions and other nucleophilic substitutions. It is also extensively used as an extractant in biochemistry and cell biology. Because DMSO is only weakly acidic, it tolerates relatively strong bases and as such has been extensively used in the study of carbanions. A set of non-aqueous pKa values (C-H, O-H, S-H and N-H acidities) for thousands of organic compounds have been determined in DMSO solution. Because of its high boiling point, 189 °C (372 °F), DMSO evaporates slowly at normal atmospheric pressure. Samples dissolved in DMSO cannot be as easily recovered compared to other solvents, as it is very difficult to remove all traces of DMSO by conventional rotary evaporation. One technique to fully recover samples is removal of the organic solvent by evaporation followed by addition of water (to dissolve DMSO) and cryodesiccation to remove both DMSO and water. Reactions conducted in DMSO are often diluted with water to precipitate or phase-separate products. The relatively high freezing point of DMSO, 18.5 °C (65.3 °F), means that at, or just below, room temperature it is a solid, which can limit its utility in some chemical processes (e.g. crystallization with cooling). In its deuterated form (DMSO-d6), it is a useful solvent for NMR spectroscopy, again due to its ability to dissolve a wide range of analytes, the simplicity of its own spectrum, and its suitability for high-temperature NMR spectroscopic studies. Disadvantages to the use of DMSO-d6 are its high viscosity, which broadens signals, and its hygroscopicity, which leads to an overwhelming H2O resonance in the 1H NMR spectrum. It is often mixed with CDCl3 or CD2Cl2 for lower viscosity and melting points. DMSO is finding increased use in manufacturing processes to produce microelectronic devices. It is widely used to strip photoresist in TFT-LCD 'flat panel' displays and advanced packaging applications (such as wafer-level packaging / solder bump patterning). It also used in biopreservation especially stem cell banking. DMSO is an effective paint stripper, being safer than many of the others such as nitromethane and dichloromethane. Because of its ability to dissolve many kinds of compounds, DMSO plays a role in sample management and high-throughput screening operations in drug design. DMSO is used in polymerase chain reaction (PCR) to inhibit secondary structures in the DNA template or the DNA primers. It is added to the PCR mix before reacting, where it interferes with the self-complementarity of the DNA, minimizing interfering reactions. DMSO in a PCR reaction is applicable for supercoiled plasmids (to relax before amplification) or DNA templates with high GC-content (to decrease thermostability). For example, 10% final concentration of DMSO in the PCR mixture with Phusion decreases primer annealing temperature (i.e. primer melting temperature) by 5.5–6.0 °C (9.9–10.8 °F). It is well known as a reversible cell cycle arrester at phase G1 of human lymphoid cells. DMSO may also be used as a cryoprotectant, added to cell media to reduce ice formation and thereby prevent cell death during the freezing process. Approximately 10% may be used with a slow-freeze method, and the cells may be frozen at −80 °C (−112 °F) or stored in liquid nitrogen safely. DMSO has been used as a co-solvent to assist absorption of the flavonol glycoside Icariin into the C. elegans nematode worm. In cell culture, DMSO is used to induce differentiation of P19 embryonic carcinoma cells into cardiomyocytes and skeletal muscle cells. Use of DMSO in medicine dates from around 1963, when an Oregon Health & Science University Medical School team, headed by Stanley Jacob, discovered it could penetrate the skin and other membranes without damaging them and could carry other compounds into a biological system. In medicine, DMSO is predominantly used as a topical analgesic, a vehicle for topical application of pharmaceuticals, as an anti-inflammatory, and an antioxidant. Because DMSO increases the rate of absorption of some compounds through biological tissues, including skin, it is used in some transdermal drug delivery systems. Its effect may be enhanced with the addition of EDTA. It is frequently compounded with antifungal medications, enabling them to penetrate not just skin but also toenails and fingernails. DMSO has been examined for the treatment of numerous conditions and ailments, but the U.S. Food and Drug Administration (FDA) has approved its use only for the symptomatic relief of patients with interstitial cystitis. A 1978 study concluded that DMSO brought significant relief to the majority of the 213 patients with inflammatory genitourinary disorders that were studied. The authors recommended DMSO for genitourinary inflammatory conditions not caused by infection or tumor in which symptoms were severe or patients failed to respond to conventional therapy. A gel containing DMSO, dexpanthenol, and heparin, is sold in Germany and eastern Europe (commercialized under the Dolobene brand) for topical use in sprains, tendinitis, and local inflammation. In interventional radiology, DMSO is used as a solvent for ethylene vinyl alcohol in the Onyx liquid embolic agent, which is used in embolization, the therapeutic occlusion of blood vessels. In medical research, DMSO is often used as a drug vehicle in in vivo and in vitro experiments. However, when a researcher is unaware of its pleiotropic effects, or when the control groups are not carefully planned, a bias can occur; an effect of DMSO can be falsely attributed to the drug. For example, even a very low dose of DMSO has a powerful protective effect against paracetamol (acetaminophen)-induced liver injury in mice. 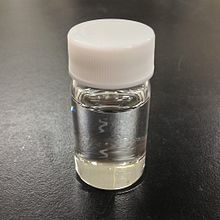 In cryobiology DMSO has been used as a cryoprotectant and is still an important constituent of cryoprotectant vitrification mixtures used to preserve organs, tissues, and cell suspensions. Without it, up to 90% of frozen cells will become inactive. It is particularly important in the freezing and long-term storage of embryonic stem cells and hematopoietic stem cells, which are often frozen in a mixture of 10% DMSO, a freezing medium, and 30% fetal bovine serum. In the cryogenic freezing of heteroploid cell lines (MDCK, VERO, etc.) a mixture of 10% DMSO with 90% EMEM (70% EMEM + 30% fetal bovine serum + antibiotic mixture) is used. As part of an autologous bone marrow transplant the DMSO is re-infused along with the patient's own hematopoietic stem cells. DMSO is metabolized by disproportionation to dimethyl sulfide and dimethyl sulfone. It is subject to renal and pulmonary excretion. A possible side effect of DMSO is therefore elevated blood dimethyl sulfide, which may cause a blood borne halitosis symptom. DMSO is marketed as an alternative medicine. Its popularity as an alternative cure is stated to stem from a 60 Minutes documentary featuring an early proponent. However, DMSO is an ingredient in some products listed by the U.S. FDA as fake cancer cures and the FDA has had a running battle with distributors. One such distributor is Mildred Miller, who promoted DMSO for a variety of disorders and was consequently convicted of Medicare fraud. The use of DMSO as an alternative treatment for cancer is of particular concern, as it has been shown to interfere with a variety of chemotherapy drugs, including cisplatin, carboplatin, and oxaliplatin. There is insufficient evidence to support the hypothesis that DMSO has any effect, and most sources agree that its history of side effects when tested warrants caution when using it as a dietary supplement, for which it is marketed heavily with the usual disclaimer. DMSO is commonly used in veterinary medicine as a liniment for horses, alone or in combination with other ingredients. In the latter case, often, the intended function of the DMSO is as a solvent, to carry the other ingredients across the skin. Also in horses, DMSO is used intravenously, again alone or in combination with other drugs. It is used alone for the treatment of increased intracranial pressure and/or cerebral edema in horses. The perceived garlic taste upon skin contact with DMSO may be due to nonolfactory activation of TRPA1 receptors in trigeminal ganglia. Unlike dimethyl and diallyl disulfide (also with odors resembling garlic), the mono- and tri- sulfides (typically with foul odors), and other similar structures, the pure chemical DMSO is odorless. DMSO is a non-toxic solvent with a median lethal dose higher than ethanol (DMSO: LD50, oral, rat, 14,500 mg/kg; ethanol: LD50, oral, rat, 7,060 mg/kg). Early clinical trials with DMSO were stopped because of questions about its safety, especially its ability to harm the eye. The most commonly reported side effects include headaches and burning and itching on contact with the skin. Strong allergic reactions have been reported. [full citation needed] DMSO can cause contaminants, toxins, and medicines to be absorbed through the skin, which may cause unexpected effects. DMSO is thought to increase the effects of blood thinners, steroids, heart medicines, sedatives, and other drugs. In some cases this could be harmful or dangerous. It is a developmental neurotoxin. In Australia, it is listed as a Schedule 4 (S4) Drug, and a company has been prosecuted for adding it to products as a preservative. Because DMSO easily penetrates the skin, substances dissolved in DMSO may be quickly absorbed. Glove selection is important when working with DMSO. Butyl rubber, fluoroelastomer, neoprene, or thick (15 mil / 0.4 mm) latex gloves are recommended. Nitrile gloves, which are very commonly used in chemical laboratories, may protect from brief contact but have been found to degrade rapidly with exposure to DMSO. On September 9, 1965, The Wall Street Journal reported that a manufacturer of the chemical warned that the death of an Irish woman after undergoing DMSO treatment for a sprained wrist may have been due to the treatment, although no autopsy was done, nor was a causal relationship established. Clinical research using DMSO was halted and did not begin again until the National Academy of Sciences (NAS) published findings in favor of DMSO in 1972. In 1978, the US FDA approved DMSO for treating interstitial cystitis. In 1980, the US Congress held hearings on claims that the FDA was slow in approving DMSO for other medical uses. In 2007, the US FDA granted "fast track" designation on clinical studies of DMSO's use in reducing brain tissue swelling following traumatic brain injury. DMSO exposure to developing mouse brains can produce brain degeneration. This neurotoxicity could be detected at doses as low as 0.3 mL/kg, a level exceeded in children exposed to DMSO during bone marrow transplant. DMSO disposed into sewers can also cause odor problems in municipal effluents: waste water bacteria transform DMSO under hypoxic (anoxic) conditions into dimethyl sulfide (DMS) that has a strong disagreeable odor, similar to rotten cabbage. However, chemically pure DMSO is odorless because of the lack of C-S-C (sulfide) and C-S-H (mercaptan) linkages. Deodorization of DMSO is achieved by removing the odorous impurities it contains. Dimethyl sulfoxide can produce an explosive reaction when exposed to acyl chlorides; at a low temperature, this reaction produces the oxidant for Swern oxidation. Gloria Ramirez, also known as the "Toxic Woman"
^ Novak, K. M., ed. (2002). Drug Facts and Comparisons (56th ed.). St. Louis, Missouri: Wolters Kluwer Health. p. 619. ISBN 978-1-57439-110-7. ^ A. Saytzeff (1867) "Ueber die Einwirkung von Saltpetersäure auf Schwefelmethyl und Schwefeläthyl" (On the effect of nitric acid on methyl sulfide and ethyl sulfide) Annalen der Chemie und Pharmacie, 144: 148–156; see page 150, where dimethyl sulfoxide is called "Dimethylschwefeloxyd". ^ Epstein WW, Sweat FW (March 1967). "Dimethyl Sulfoxide Oxidations". Chemical Reviews. 67 (3): 247–260. doi:10.1021/cr60247a001. ^ Tidwell TT. (1990). "Oxidation of Alcohols by Activated Dimethyl Sulfoxide and Related Reactions: An Update". Synthesis. 1990 (10): 857–870. doi:10.1055/s-1990-27036. ^ Calligaris, Mario (2004). "Structure and bonding in metal sulfoxide complexes: An update". Coordination Chemistry Reviews. 248 (3–4): 351–375. doi:10.1016/j.ccr.2004.02.005. ^ "DMSO". exactantigen.com. Archived from the original on 2009-10-05. Retrieved 2009-10-02. ^ Bordwell FG (1988). "Equilibrium acidities in dimethyl sulfoxide solution". Accounts of Chemical Research. 21 (12): 456–463. doi:10.1021/ar00156a004. ^ Chakrabarti R, Schutt CE. ; Schutt (August 2001). "The enhancement of PCR amplification by low molecular-weight sulfones". Gene. 274 (1–2): 293–298. doi:10.1016/S0378-1119(01)00621-7. PMID 11675022. ^ "Guidelines for PCR Optimization with Phusion High-Fidelity DNA Polymerase". ^ Pegg, DE. (2007). Day JG, Stacey GN (eds.). Principles of Cryopreservation. Cryopreservation and Freeze-Drying Protocols, Second Edition. Methods in Molecular Biology. 368. Humana Press. pp. 39–57. doi:10.1007/978-1-59745-362-2_3. ISBN 978-1-58829-377-0. ISSN 1064-3745. PMID 18080461. ^ Johannes Geiss (2001). The century of space science. Kluwer Academic. p. 20. ISBN 978-0-7923-7195-3. Retrieved Aug 7, 2011. ^ "Import Alert 62-06". www.accessdata.fda.gov. Archived from the original on 2017-02-04. Retrieved 2017-03-05. ^ "Dolobene Gel 100 g - Grovet.com". www.grovet.com. Retrieved 2016-11-12. ^ Michael, J (1985). "Kurzzeitbehandlung von Sportverletzungen". In Jacob, S.W. ; Herschler, R.J.; Schmellenkamp, H. (eds.). DMSO (in German). Springer. pp. 58–60. doi:10.1007/978-3-642-70428-4_9. ISBN 978-3-642-70428-4. ^ Kelava T, Cavar I (Nov 2011). "Biological actions of drug solvents". Periodicum Biologorum. 113 (3): 311–320. ^ a b c Jarvis, William T. (24 November 2001). "DMSO". National Council Against Health Fraud. ^ "187 Fake Cancer "Cures" Consumers Should Avoid". FDA. Archived from the original on 23 July 2017. ^ Hall, M. D.; Telma, K. A.; Chang, K.-E.; Lee, T. D.; Madigan, J. P.; Lloyd, J. R.; Goldlust, I. S.; Hoeschele, J. D.; Gottesman, M. M. (8 May 2014). "Say No to DMSO: Dimethylsulfoxide Inactivates Cisplatin, Carboplatin and Other Platinum Complexes". Cancer Research. 74 (14): 3913–22. doi:10.1158/0008-5472.CAN-14-0247. PMC 4153432. PMID 24812268. ^ Lübbert, Matthias; Kyereme, Jessica; Schöbel, Nicole; Beltrán, Leopoldo; Wetzel, Christian Horst; Hatt, Hanns (October 21, 2013). "Transient Receptor Potential Channels Encode Volatile Chemicals Sensed by Rat Trigeminal Ganglion Neurons". PLOS ONE. 8 (10): e77998. Bibcode:2013PLoSO...877998L. doi:10.1371/journal.pone.0077998. PMC 3804614. PMID 24205061. ^ "Safety Data Sheet: Dimethyl Sulfoxide (DMSO)" (PDF). Gaylord Chemical Company, L.L.C. 21 July 2016. Archived (PDF) from the original on 13 February 2019. ^ "Material Safety Data Sheet: Dimethyl Sulfoxide". ScienceLab.com. 21 May 2013. Archived from the original on 19 September 2018. ^ "Material Safety Data Sheet: Ethyl alcohol 200 Proof". ScienceLab.com. 21 May 2013. Archived from the original on 19 September 2018. ^ "DMSO". American Cancer Society. Archived from the original on 27 July 2010. ^ Hanslick, JL; Lau, K; Noguchi, KK; Olney, JW; Zorumski, CF; Mennerick, S; Farber, NB (2009). "Dimethyl sulfoxide (DMSO) produces widespread apoptosis in the developing central nervous system". Neurobiology of Disease. 34 (1): 1–10. doi:10.1016/j.nbd.2008.11.006. PMC 2682536. PMID 19100327. ^ "Chemical hygiene plan" (PDF). Cornell University. October 1999. Retrieved 2010-04-12. ^ Carley W. (September 9, 1965). "DMSO may have caused death of woman, makers of 'Wonder' drug warn doctors". The Wall Street Journal. New York City. ^ George Kvakovszky, et. al., "Process for preparing low malodorous dimethyl sulfoxide", US patent application number 20090005601 (2009). ^ a b c Roth/Weller: Gefährliche Chemische Reaktionen, ecomed Sicherheit, Verlagsgruppe Hüthig Jehle Rehm, Landsberg/Lech, 31. Ergänzungslieferung 8/2000. Wikimedia Commons has media related to dimethyl sulfoxide.